Billionaire's Shortbread - a fancy name for delicious layers of buttery shortbread, caramel, and chocolate. 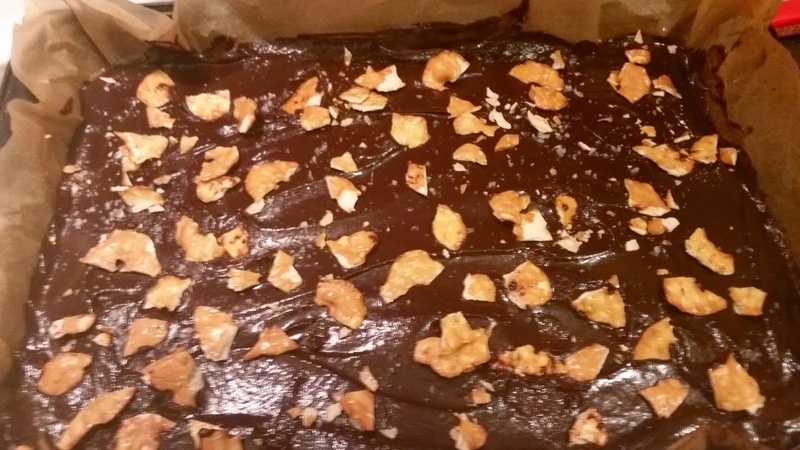 'Twould be just Millionaire's Shortbread, but making the chocolate layer a ganache and the addition of fleur de sel (flaky salt), and other toppings takes it up to the next level. 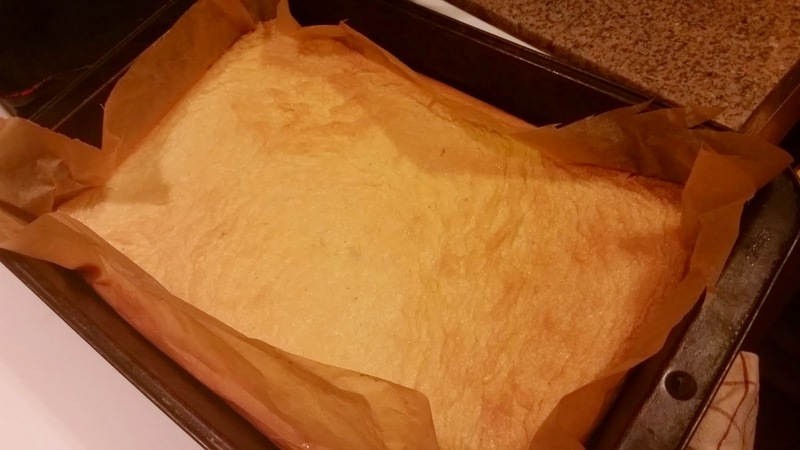 There are three stages to making this, since each layer needs to cool. You could do one layer a night if you want to do this during the week, or just do the whole thing between spurts of housework or binge-watching. I recommend leaving a few hours between caramel and ganache to allow the caramel to really set up, but the 45 minutes suggested below will do as well. 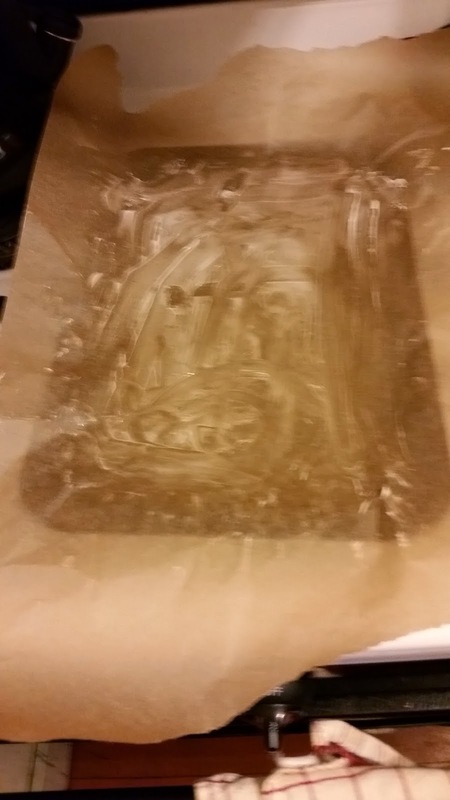 Preheat the oven to 350 and prepare a 9" x 13" pan with buttered parchment paper (butter side up). 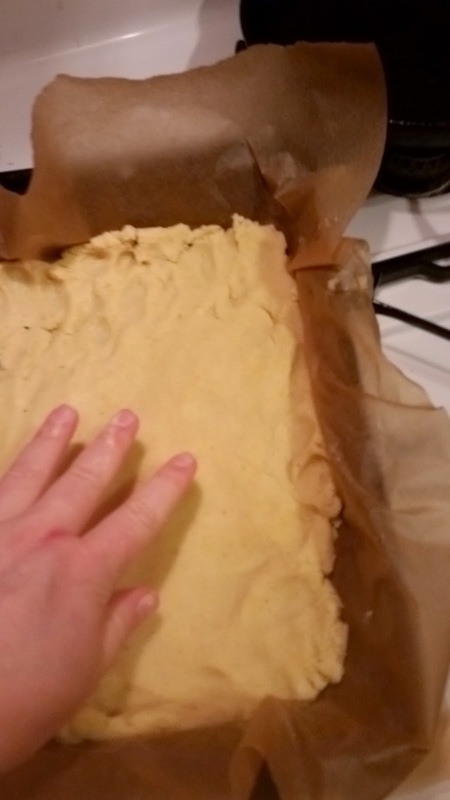 You can just grease the pan itself, but if you line it with parchment paper or aluminum foil and butter that, it'll be much easier to cut the final product into pretty bars when all the layers are done. 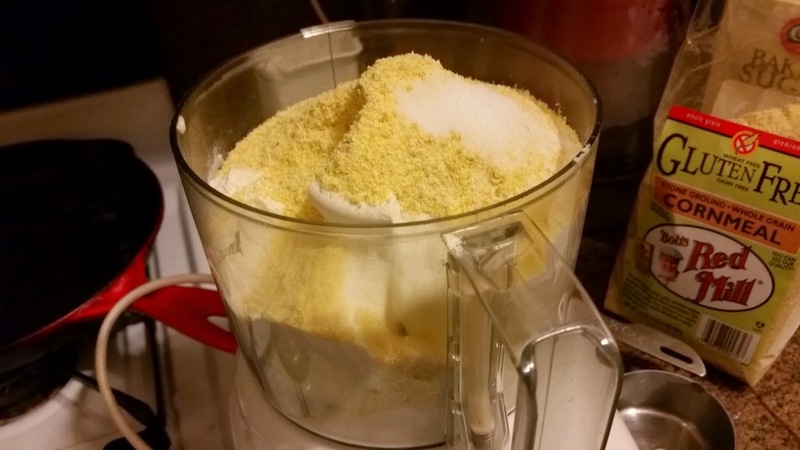 Put the ingredients into a food processor and pulse until they form a dough. This itty bitty food processor (because I have an itty bitty kitchen) couldn't handle all the ingredients, but a regular size one will. If you don't have a food processor, you can use a pastry cutter to work the butter into the other ingredients and then finish it off with a wooden spoon. If you do it the hard way, imagine yourself in the Downton Abbey kitchen with Daisy and Mrs. Patmore. Can you believe I forgot to watch last night? Thank goodness for the DVR. I dumped the whole thing into my stand mixer with the paddle and watched it carefully to make sure I didn't over-mix it. 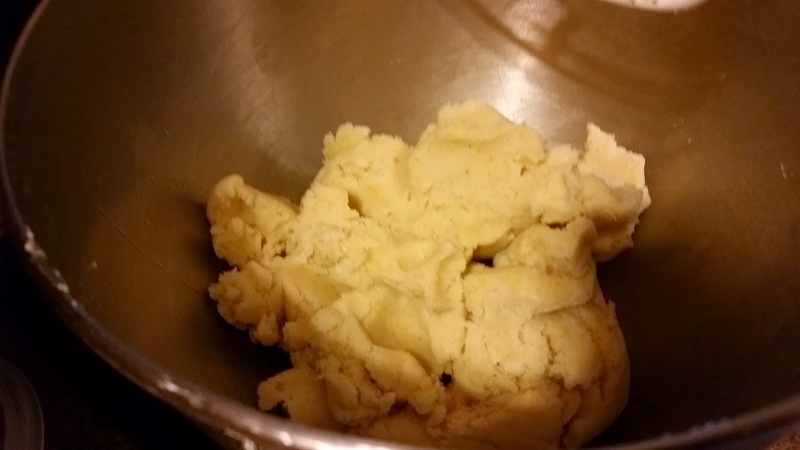 The dough will look like this when it has come together - stop mixing as soon as it all comes into a big clump. Pat the dough into the pan with your fingers. Get it as even as you can. Trim the paper so it still hangs over the edges but doesn't quite stick out this much. Bake at 350 for 25-30 minutes until nice and golden. This is a touch pale in the middle, but it will keep cooking for a few minutes when you take it out of the oven. Remove from the oven and let cool completely, at least an hour. Letting it cool will give it the crisp, crumbly texture you want in a shortbread. 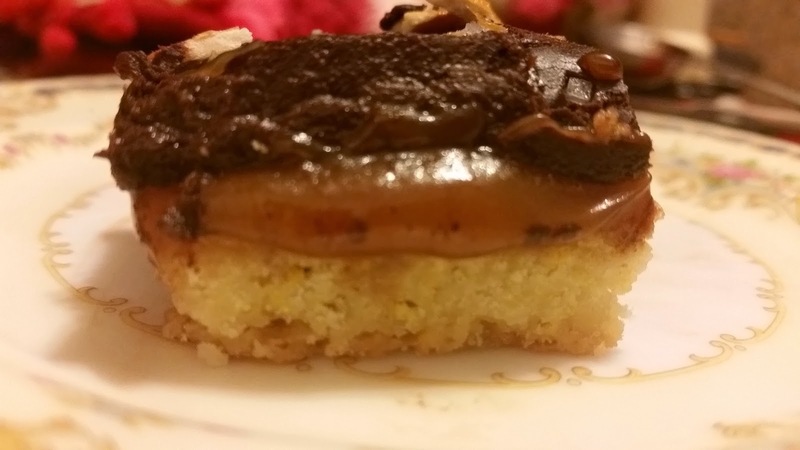 The caramel is the trickiest part. It requires some focus and patience. Brew yourself a nice cup of tea to sip while you make it. Or pour a little nip. 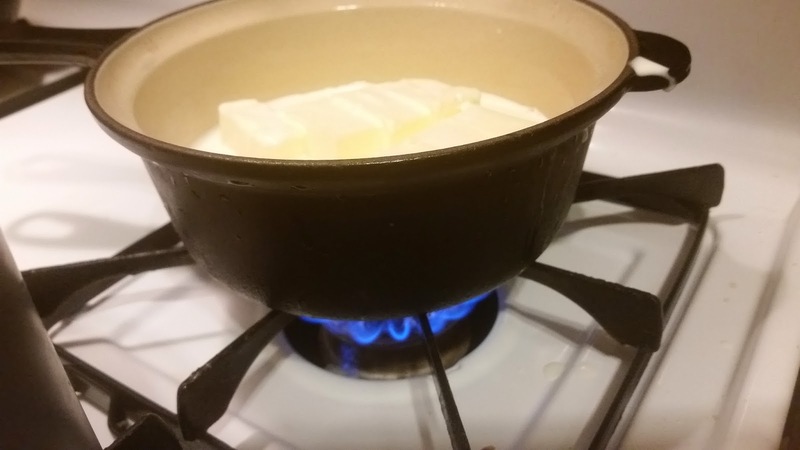 Melt the butter and salt into the cream in a small pan over low-medium heat. Make sure not to boil this...if it starts to simmer, turn it down a smidge. 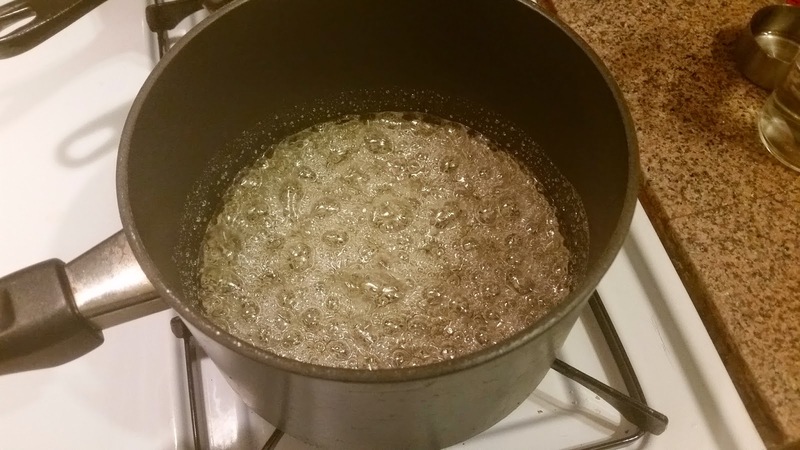 Put the sugar, corn syrup and water into a medium pan. Note: the corn syrup is Karo syrup, less nasty than the high-fructose variety in junk foods. You can replace it with more sugar, but it's your Caramel Insurance Policy. I had to throw out two batches and start over when I tried to do this with just sugar because it crystallized on me! 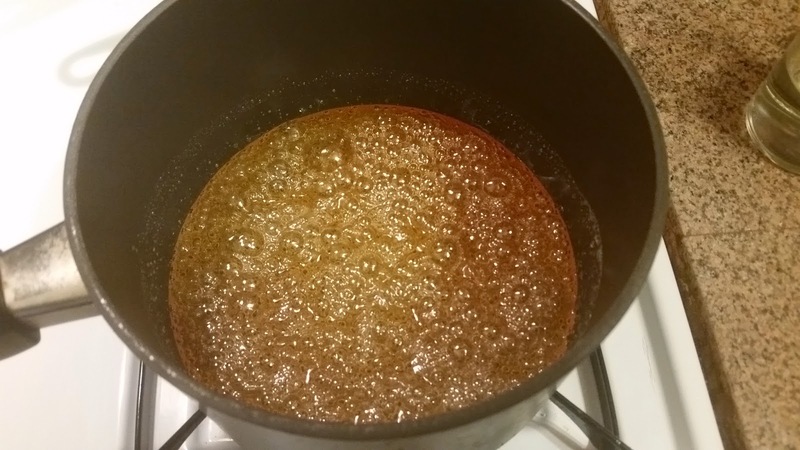 It helps ensure that your caramel will work and you won't be throwing out tons of perfectly good sugar. 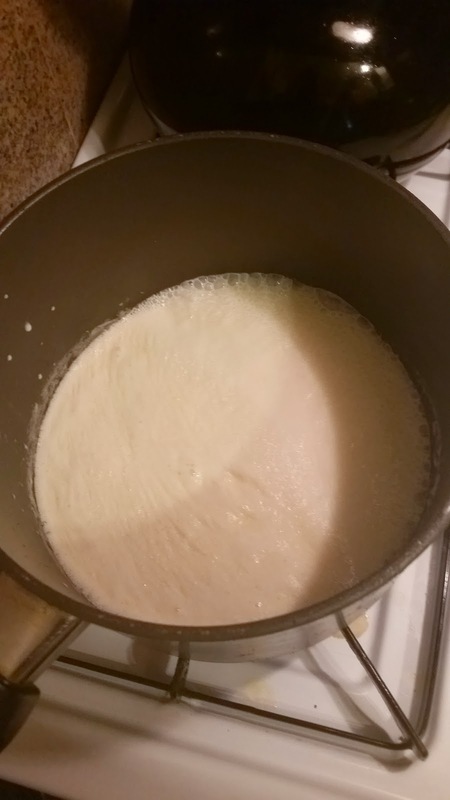 When it starts to look like the above right photo, swirl a little from time to time but do not stir. Keep a close eye on it as it gradually changes color. Sip your tea and hang in there for 5-15 minutes. 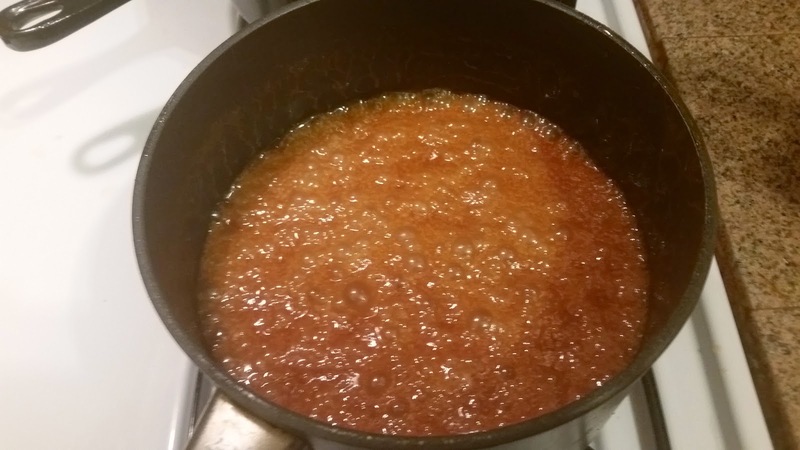 When it gets to the lovely brown color below and -just- barely starts to smell like burnt sugar, turn off the heat and CAREFULLY stir in the cream mixture. Turn the heat back on to medium, medium high and cook a few minutes more, stirring often. 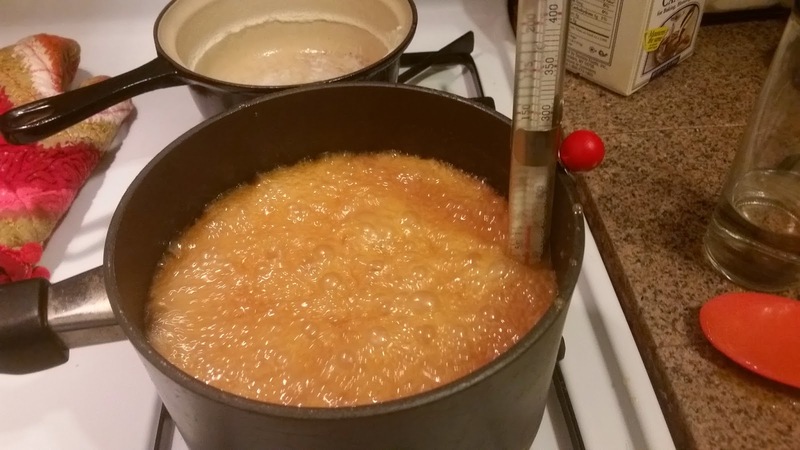 If you have a candy thermometer, stick it in now - you're aiming for 230 degrees. If you don't, watch for the color change below. When it's 230 degrees or this beautiful brown color on the right, pour it over the shortbread. Chill for 45 minutes. 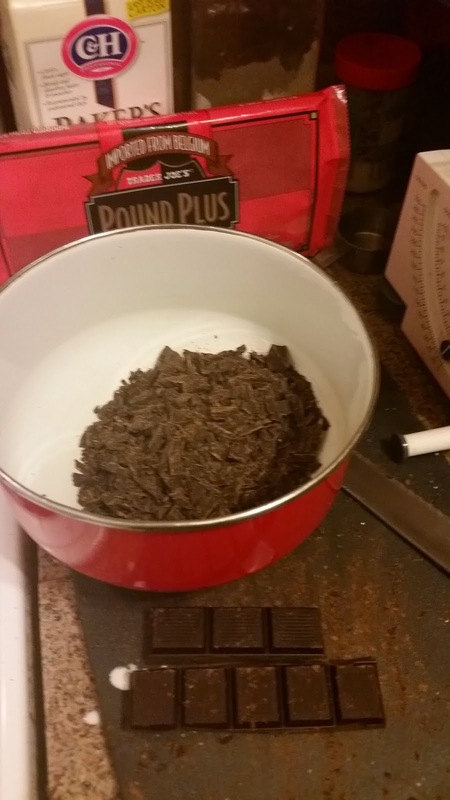 Chop the chocolate finely with a serrated knife. Nobody told me to use this kind of knife for the first few years I was making ganache - it really really helps! If you don't have one, a regular knife will do. Bring the heavy cream and coffee to a simmer that's ALMOST a boil, but don't scald it. Pour the cream over the chocolate and stir stir stir with a wooden spoon or a whisk. Now you have ganache! Pour it over the caramel layer. Put the ganache in the fridge for a few minutes before sprinkling the sea salt on top (otherwise it will dissolve in the warm chocolate). Remove while still not set up and sprinkle the sea salt and any other toppings you like over the ganache. Return it to the fridge for another 30 min - 1 hour. 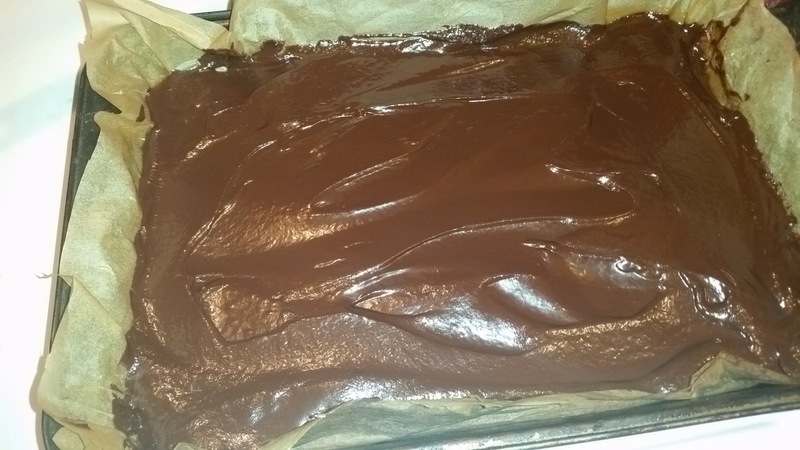 When the ganache is set, gently pull the whole thing out of the pan by the parchment paper or foil. Place it on a cutting board and slice pretty squares. The uneven bits on the edges can be chef's snacks :-). Keep in the fridge and bring to room temp before serving if you can bear to wait that long. I'm going to pack most of this up to take to the office tomorrow, and then I'm off to the Y for some calorie-burning cardio!